According to the old Norse legends, the Kraken was really a collateral damage kind of monster. Sure, the giant cephalopod would spitefully strike at ships, but he was likeliest to drown you after he had given up on the idea and decided to go home. Apparently, when the Kraken dove beneath the waves, he caused a whirlpool that sunk ships and sucked sailors to the seafloor. That whirlpool is what I have tried to capture here. 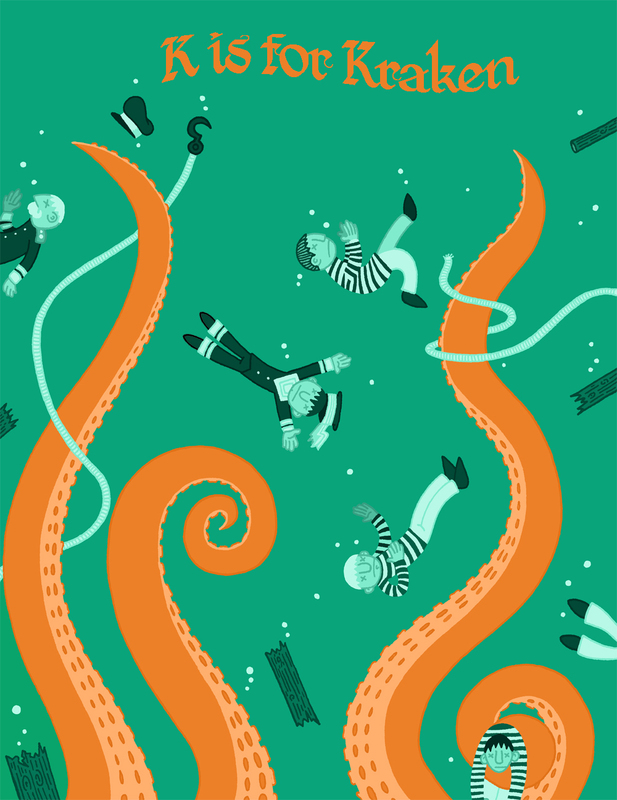 In this drawing, the Kraken sinks back into the deep, dragging with him debris and the corpses of drowned sailors. To portray this moment, I had to “zoom out,” so to speak. Usually, my drawings are fairly “zoomed in,” with their subjects (usually single figures or small groups), taking up lots of space, mostly around the center of the page. In this piece, I used lots of smaller figures to show movement, environment, and scale. This necessitated a more distant vantage than I usually employ. This drawing is also unique in my monster series in that it obscures its star. So far, the Kraken is the only creature I’ve drawn who is largely absent from his portrait. I like that about him. It adds to his mystery and menace. All we see of him are trailing tentacles and the considerable devastation bobbing in their wake. This somehow makes him seem both stealthy (we never got a good look at him!) and incomprehensibly huge. At first, I was not very happy with this page and was afraid I was phoning it in. The simplicity of the drawing, and all the blank space in the picture, seemed like signs of laziness to me. Now that it’s done, though, I’ve really come around. I like this one a lot and I hope that it signals a growing willingness/ability to shake this series up a little bit. This entry was posted on November 19, 2010 at 6:21 AM and is filed under Center for Cartoon Studies, Cryptozoology, Monster Alphabet, Monsters, Thesis with tags Alphabet Book, Cryptozoology, Giant Squid, K is For, Kraken, Monster, Octopus, Sea Monster. You can follow any responses to this entry through the RSS 2.0 feed. You can leave a response, or trackback from your own site. lol. found this here. i have a music project called k is for kraken.